Enter the total value of the certificate you would like. If you would like more than one certificate just add another one to your cart. Printable Sleigh Ride Gift Certificates are a great option for Birthdays, Anniversary’s, Holidays, and any other special event. Quick and easy, pay and print. No shipping, instant email delivery. They do not expire. 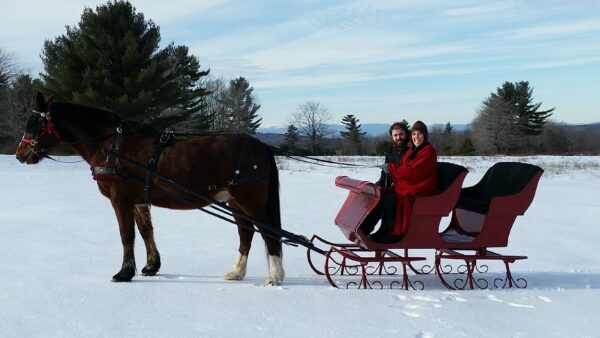 The small red sleigh is for Couples Sleigh Rides only. 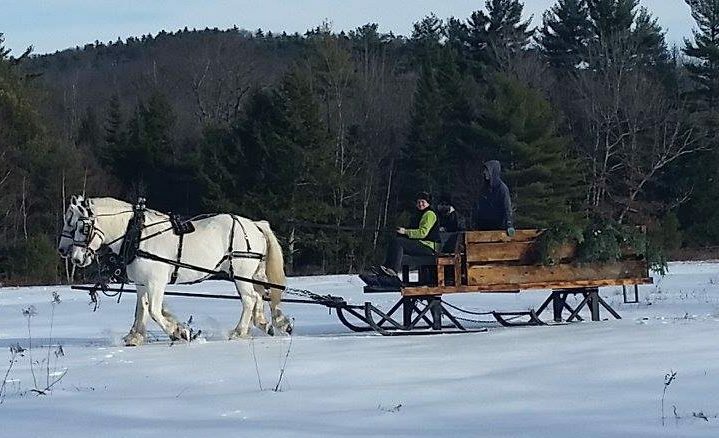 This sleigh ride is available any day of the week for $150 by reservation only. Both sleighs are available during the week for groups or individuals that would like to join us for a sleigh ride. 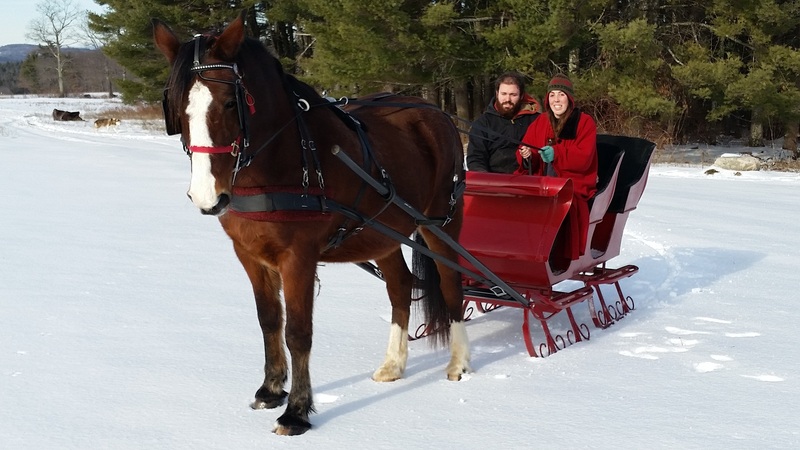 The larger sleigh can be reserved for a group of 6 adults and 6 “lap” children per ride, for 30 minutes for $225 and the red sleigh can be reserved for a couple for 30 minutes for $150. 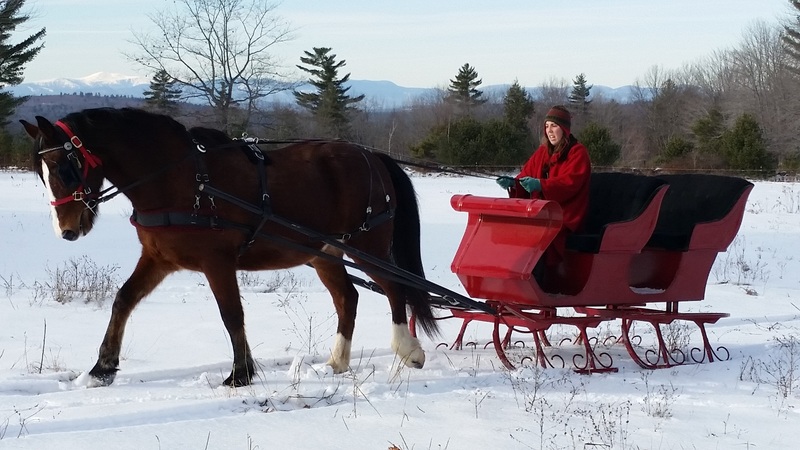 The large sleigh holds 6 adults and 6 “lap” children will be available 11 to 3 every weekend as long as trail conditions are favorable. Reservations are recommended three days in advance but not required. The cost is $20 per adult, $10 for children 4 to 12 (all children must be accompanied by an adult) or $55 for a family of four with two children under the age of 13. The way our reservation system will work, is that we will give our customers a time, such as 1 pm. Everyone should arrive and be ready to board at 1 pm, but if others reserved for the same time were here earlier they will go first and your group may have to wait until the 1:30 trip. That way if anyone shows up late, we can still fill each ride and be ready for the next one. 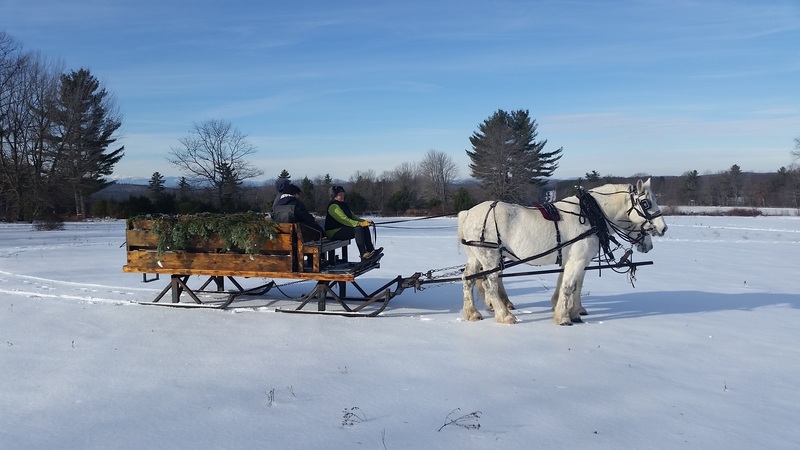 So be prepared to come have a good time, hang out around the fire and watch trail riders and sleigh riders enjoy themselves. We will not reserve more people per hour than we can take so you will be guaranteed a spot during that hour. These rides are about 20 minutes long to ensure that the horses get a 10 minute rest between each trip.